Looking for bivvy bags? Check out our Buyer's Guide! Your equipment should not be missing a bivvy bag, whether you're into trekking or alpine tours. Bivvy sacks are windproof outer shells for sleeping bags, which allow you to sleep under the stars. Bivvy bags are a good alternative to tents, particularly if you're planning a major tour and would like to reduce the weight of your equipment to a minimum. But bivvy bags are more than just substitute tents! In cases of emergency, bivvy bags can truly save your life. When you're on a mountain tour and can't make it to the next cabin, set up your night camp and take shelter under your bivvy bag if the weather shifts significantly. Bivvy bags can also be used to shelter accident victims and keep them warm until rescue teams arrive. A good bivvy bag should be wind and waterproof and protect the body from cooling down at night. Moreover, weight and packed dimensions should be kept at a minimum. 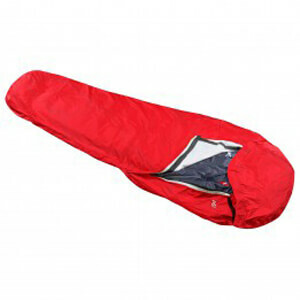 Waterproof bivvy bags with a breathable membrane are recommendable for spending the night outdoors at low temperatures. Non-breathable bivvy bags are cheaper, however, their major disadvantage is the accumulation of condensed water on the inside when temperatures drop. Thus, the sleeping bag is getting wet and doesn't keep the user warm anymore. Be it for bivouac purposes or as emergency equipment, bivvy bags are an essential companion on every major trip. Tucked in your sleeping bag with your bivvy bag pulled up to your nose, you're protected against wind, weather, and cold, and recharge your batteries for the following day.